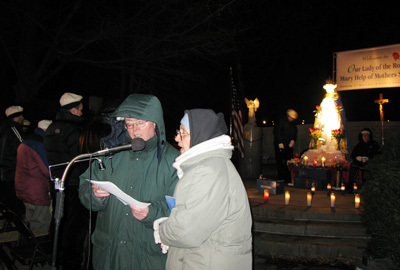 Vigil Coordinator, James Donohue, LOSM and Mary Ann Pressamarita of East Hampton, Conn. singing Christmas carols at the February 2 Vigil of the Purification of the Blessed Virgin Mary. 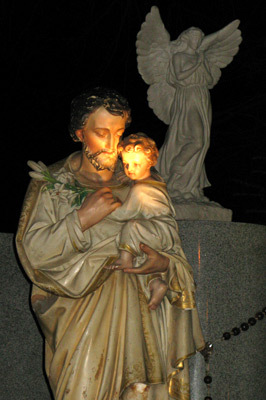 The Purification officially ends the Christmas cycle. 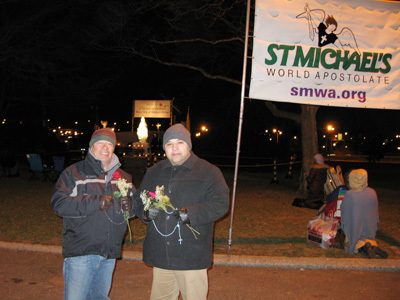 (l. to r.) Peter Frank, LOSM, and Michael Mangan, LOSM and SMWA President. 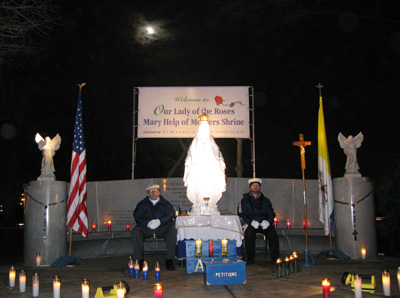 The moon emerges in the background during the February 10 eve of Our Lady of Lourdes Vigil. 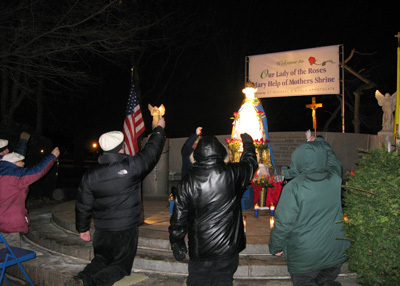 Polaroid photo taken of Our Lady’s statue (c.) by William Dykes, LOSM, at the February 10, 2009 Rosary Vigil. 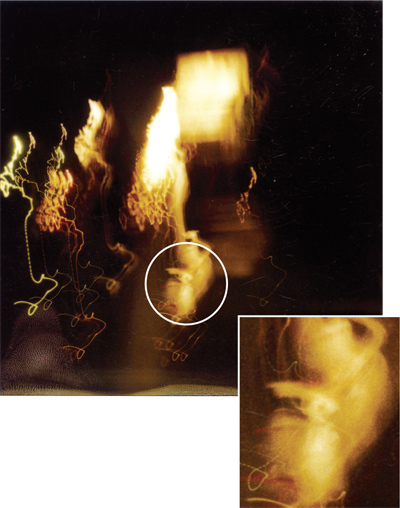 He took the photo on his own initiative for the intention of Michael Mangan, LOSM. 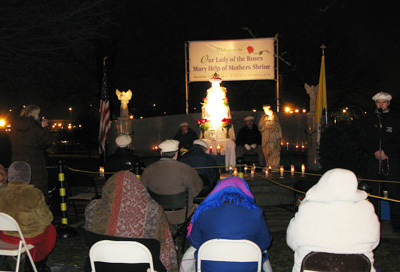 The statue miraculously appears all aglow and below it you’ll see what appears to be the side profile of the Pope, facing left, seated in his white cassock bathed in yellow (symbolic color of the papacy), with hand raised and index finger pointing (circled; see also enlargement). 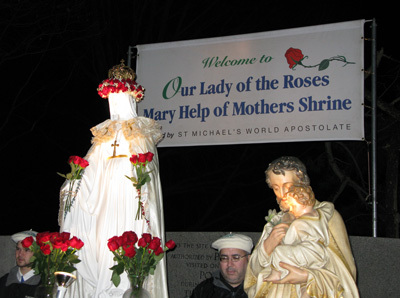 Note the thick beam of light emitting from Our Lady to the Pope’s head. 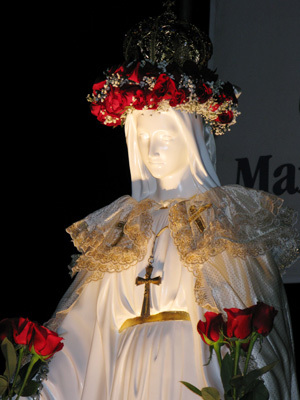 It seems Our Lady of the Roses is inspiring Benedict XVI who in turn is pointing the way to the faithful: “Go to Her sacred grounds.” And why wouldn’t he? 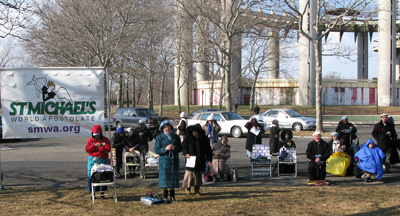 We have an outdoor Holy Hour every Sunday, often braving harsh elements, specifically, for the intention of the Pope and clergy. 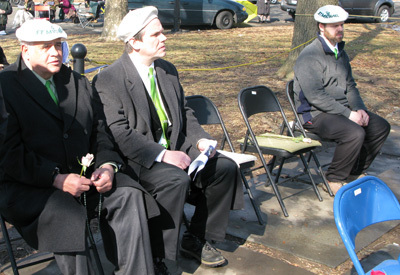 "Prayer is the most powerful force in the light now, My children. 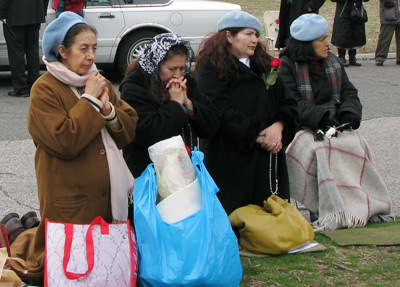 It is a form of penance; it is a form of begging for the repatriation of souls." 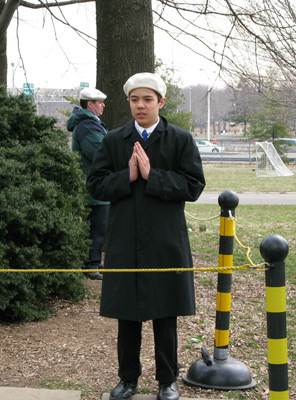 Joseph Valle, 12, of Kew Gardens, N.Y. praying devoutly at the March 22 Sunday Holy Hour. 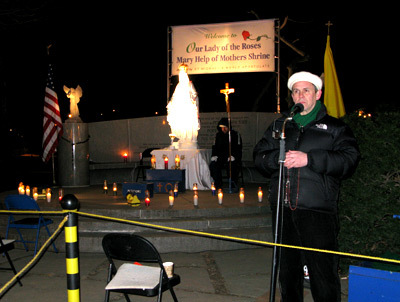 Michael Mangan, LOSM and SMWA President, leading a rosary. 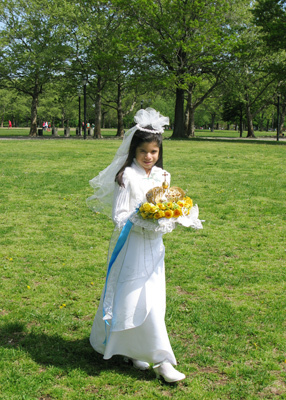 May 3, 2009 10:30 a.m.